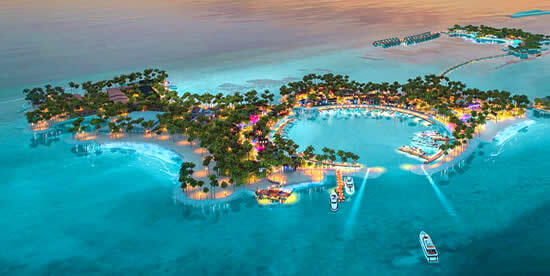 The development of the multi-island integrated resort project Emboodhoo Lagoon, known as "CROSSROADS", is the most comprehensive and expansive tourism project in the Maldives, opening a new wave of investment opportunities. 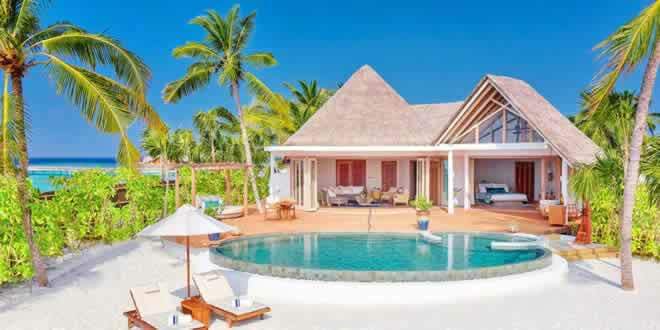 The project, a game changer that will transform the face of the Greater Male region and expand the attractiveness of the Maldives as a multi-faceted tourist destination is managed by Singha Estate PLC, a well-known real estate developer in Thailand. CROSSROADS presented as "where cultures meet," proceeds from the fact that the Maldives are strategically located on the Silk Road, crossing the East and the West, a direction where the paths of different cultures crossed and interacted with each other in the past. CROSSROADS will further strengthen this experience when designer Bill Bensley has included in the project a lot of oriental and western impressions. The Township; The entertainment island and the Transient Resort are being developed by Bill Bensley along with HBA, SCDA and EcoId behind projects of other islands. Emboodhoo Lagoon: CROSSROADS is seven kilometers long and consists of nine reclaimed islands. The scale of the project proved to be a difficult task for seven months of operation, and reclamation was completed on time as a result of a joint communication between the developer, the drainage companies, the Environmental Protection Agency (EPA) and the government. The total cost of the investment for phase 1, that includes the Township and three hotels is 311 million US dollars, while the total cost of the project for the first and second stages is expected to be $ 696 million. Located just 15 minutes by speedboat from Velana International Airport, Emboodhoo Lagoon is only 8 km from Male. CROSSROADS will consist of separate resorts with their own jetties for the arrival and between-resort water transfers, Township; an island of entertainment consisting of more than 60 different shops, cafes, bars and restaurants, a cultural center that demonstrates the beauty of the Maldives and some art and craft offers that will support local artists and the center of the marine life center where knowledge on conservation will be presented and augmentation of corals. 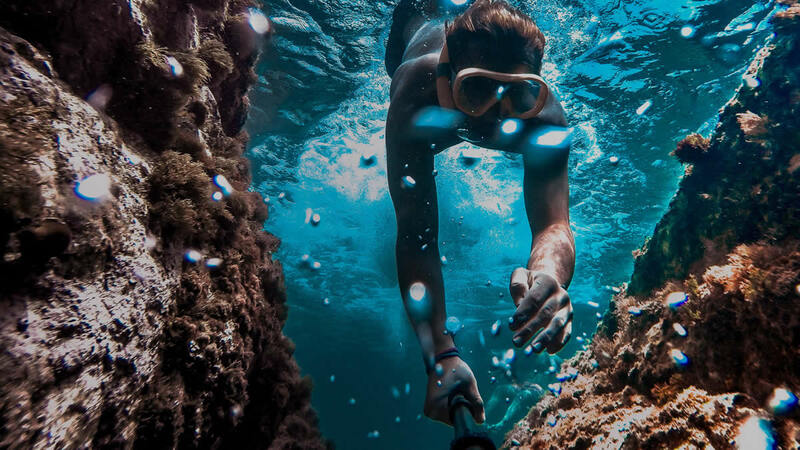 The Upscale Lifestyle Resort will also include "Underwater Sculpture", featuring various unique sculptures that will improve the concept of the resort design, while snorkelers and divers can admire the art during scuba diving. 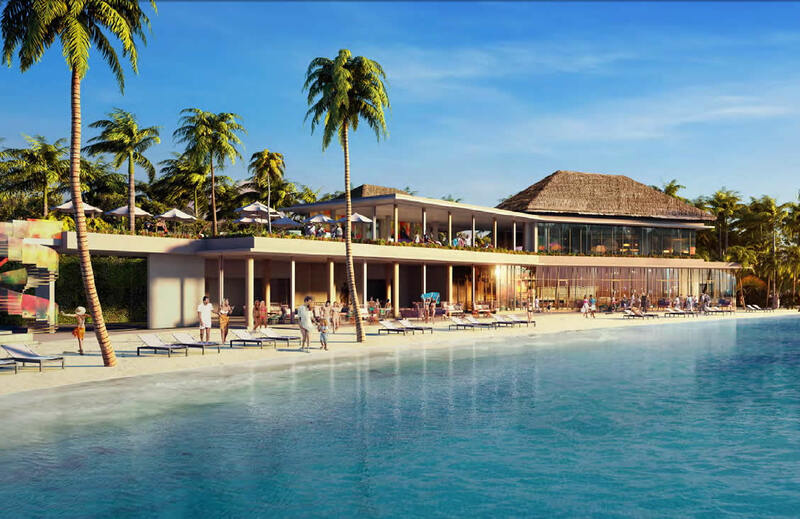 The project is divided into three phases, and in the first phase, the Hard Rock Hotel Maldives will have 178 keys, Curio by Hilton will have 198 keys, and the Upscale Lifestyle Resort (5 stars) will have 120 keys. Hard Rock Resort will serve the family market, all those who want to spend their holidays in the first themed resort hotel in the Maldives. Hard Rock Cafe Maldives is a perfect getaway where holidaymakers come to eat and mingle, catering excellent food and music, including cocktails and handmade American classics. Flaunting an exclusive beachfront area with sunbeds, Hard Rock Cafe Maldives welcomes cozy gatherings and party events alike. The integrated project will feature the Maldives's first luxury yacht marina, the eponymous establishment of The Marina at CROSSROADS, which will host the guests' private yachts and plays its role in redefining the Maldives' tourism experience. A wide range of world-renowned restaurants are set to open at The Marina @ CROSSROADS. At Hard Rock Cafe Maldives, guests can enjoy authentic American cuisine amidst the ultimate rock atmosphere with 185 indoor and outdoor seats, and exclusive beach access, taking dining with a view to a whole new level. Hard Rock Cafe Maldives is a perfect getaway where holidaymakers come to eat and mingle, catering excellent food and music, including cocktails and handmade American classics. Flaunting an exclusive beachfront area with sunbeds, Hard Rock Cafe Maldives welcomes cozy gatherings and party events alike. Cafe del Mar Maldives, the world-renowned beach club from Ibiza, offers an exclusive relax and dine experience, with an artful selection of food, drinks, and exquisite music in a setting surrounded by nature. Café del Mar Maldives boasts unique designs in a playful marriage of modern convenience, tropical intrigue, and Maldivian arts. The club caters to a great variety of tastes, from light snacks to special dinners, Woodfire Pizza and Gelato Bar, and specialty cocktails. With 300 poolside daybeds and 400 seats, the club will also have three private cabanas and a swim-up pool bar. - Ministry of Crab: A true haven for crustacean fans that celebrates Sri Lankan crabs, ranging from 500g ‘Small' crabs to 2kg ‘Crabzillas'. - Nihonbashi: A renowned Japanese restaurant that has, for 23 years, served an extensive selection of fine Japanese cuisine, crafted from the highest quality Sri Lankan ingredients. The Marina @ CROSSROADS will also feature a mix of top chain restaurants and luxury retail stores. These include: Coffee Bean & Tea Leaf, an American roast coffee and exotic tea chain; Cafe'ier, a local chic and comfortable space for special fresh roasted coffee; Saint Trop by Crepes & Co., a unique and timeless south of France cafe nestled in the heart of The Marina @ CROSSROADS; Kenny Rogers Roasters, a mid-casual dining restaurant that serves roast chicken with Kenny's famous homemade recipe. Retail stores will include Xerjoff Perfume, an Italian luxury perfumery, Divine Jewelry, and Souvenir shop. Puma, an athletic and casual footwear, apparel and accessories store, will also make an appearance, stocking limited edition, top of the line, and newest products. In addition to the Hard Rock Hotel Maldives, other international hotel brands will be represented in the CROSSROADS project. Curio by Hilton will serve bright adventurous individuals, guests who like to be near the island of entertainment and at the same time have a good privacy. The Upscale Lifestyle Resort offers luxury for couples who want more privacy, not forgetting the amenities in Township. The proximity of CROSSROADS to the country's center reduces the total cost of a trip for tourists without seaplane transfer and a significant logistics cost of transportation that allows hotels to offer more affordable rates for rooms. Scheduled ferry services from the airport and Male city will provide access to destinations for tourists and local residents, and speedboat rental services will also be available. With retailers, entertainment, restaurants, Duty Free, a cultural center, a marine life center, a multifunctional hall, a marina, a beach club, a children's club and a wellness center, CROSSROADS will provide the local community with quality shopping and entertainment that allows the average market to have more opportunities inside the country itself. Guests, themselves, can use the amenities have access to the products and services that they usually like at home. Outlets in CROSSROADS will be featured by such names as: Health & Wellness, Food & Beverage brands - include Crepes & Co and fashion stores such as Puma and Crocs. From an economic point of view the project will provide more than 5,000 jobs and about 1,200 rooms that will complement the government's transformation initiatives to open tourism for a larger market. "The CROSSROADS project shows the interest of the world's leading brands and companies in investing in the Maldives," said Economic Development Minister Mohamed Said, referring to the investment opportunities available in the Maldives. The Emboodhoo Lagoon project is one of such investment opportunities offered in the Maldives. This shows that investors are confident in the projects in the Maldives. " The event Investment Retail Opportunity, held by Singha Estate in January, proved successful due to the numerous Maldivian investors interested in international brands demonstrated on the venue. Brand offerings on the island of entertainment will enhance the retail experience for local residents and allow international networks to create an affordable market in the Maldives. "There are many investment opportunities for local businesses, from food and beverages, retail, services, arts and crafts, etc. These opportunities will enhance the tourism sector by providing a variety of tourists," says Thiti Thongbenjamas, Chief Investment Officer of Singha Estate. "The CROSSROADS project from Singha Estate is a megaproject in which all ingredients will be super success. Singha has always been associated with superiority of quality, and we have no doubt that CROSSROADS will change the Maldives' worldview for the better "
"Singha Estate has been working closely with marine biologists since the design of the project to ensure that the mega-project contributes to the creation of the pristine natural environment of the Maldives," the company said in a statement. The natural environment of the Embudhoo lagoon was carefully monitored before and during construction, and after finding a diverse coral reef and living sea turtles at one end of the Township Island, the project was immediately stopped and the construction plan redrawn to move the settlement to the opposite side of the island. To prevent any possible leakage of building toxins into seawater, most of the wet work (for example, concreting) was carried out outside the Maldives, and then the prefabricated parts were transported to assemble the structures. In addition, Singha Estate is taking active steps to launch a coral breeding program to promote marine biodiversity in areas surrounding the integrated spa. 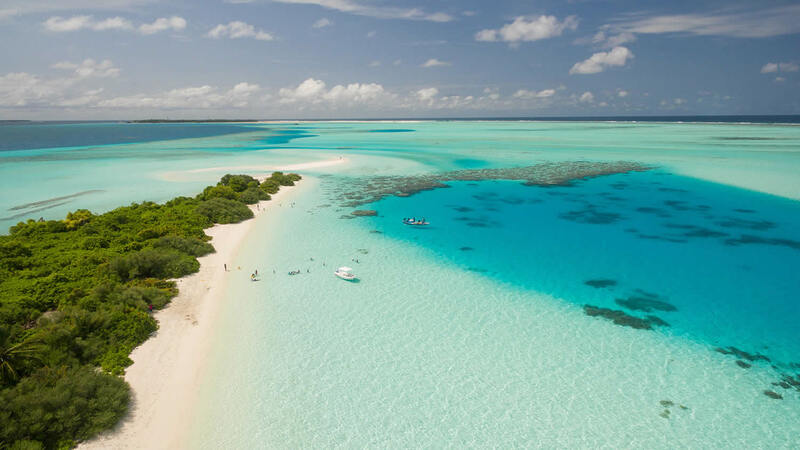 The company also creates SeaFari, the center of marine discoveries, which introduces the practice of marine biologists to preserve the marine environment of the Maldives. With regard to safety issues associated with the elevations erected on reclaimed lands, CROSSROADS ensures that all structures on the island of Township are built no higher than local coconut palms. "Security is our main task, and we ensure compliance with the statutory requirements for the hotel standard at every step. "We worked closely with consultants to ensure that all projects meet established requirements," adds the company employee. CROSSROADS is a multi-purpose resort complex for recreation and entertainment located on several islands that can serve a variety of market spectra, ranging from families and adventurers in search of unique experiences that the Maldives can offer. "Now that land reclamation is complete, we are working on the construction phase for both the front and back of the house. And we plan to welcome the guests by the end of 2018, "Singha said in an interview. With the expansion of the airport, affordable hotel deals, the rich marine life of the Maldives and additional entertainment offers, family and medium-priced options will undoubtedly expand, which will contribute to the country's economic growth and the accessibility of its tourism sector to the wider Maldives and foreigners guests.